Welcome to Dreamscape Superior Landscape Edging where we produce and sell America's #1 Choice in Landscape Edging!!! Our PRO Aluminum edging and Decorative Stone edging is not available in stores and can be shipped direct to your home, direct to your customer or anywhere you need it shipped. These products are free shipping anywhere in the continental United States. 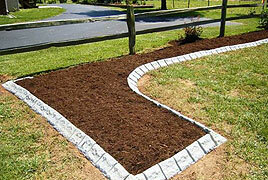 Dreamscape landscape edging will give your lawn or garden the desired shape for years to come. Aestetically appealing, Dreamscape edging will give your garden a crisp, clean edge that is pleasing to the eye. Aluminum edging permanently defines your landscape bed and can reduce maintenance and expenses over time. You landscape or garden will have crisp lines that will make your landscape more aesthetically pleasing and adds significant value to a business or residence. 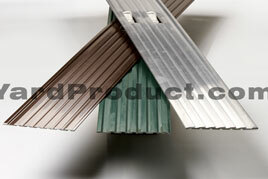 Aluminum edging will never rust, crack, rot or become brittle. 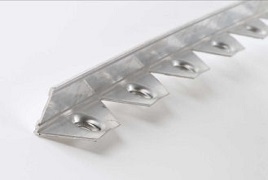 Aluminum edging is light weight, forms easily and can be cut to length with minimal effort. 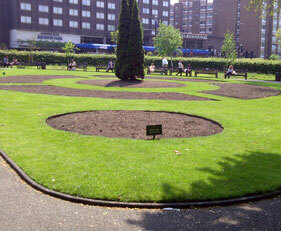 Crisp straight lines can be easily achieved in your garden or landscape. 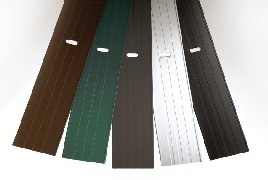 If you are looking for aluminum landscape edging, you have come to the right place. Dreamscape "stone" edging will give your lawn or garden the desired shape for years to come. Aestetically appealing, Dreamscape edging will give your garden a crisp, clean edge that is pleasing to the eye. We offer a large selection of handcrafted metal home and garden art pieces. Browse our many examples of 100% steel home and garden decor designs, metal wall hangings, indoor and outdoor wall art, metal garden stakes, handcrafted metal signs, metal sun art and moon art and custom iron art work. Dreamscape outdoor landscape lighting is an easy way to enhance the overall look of your landscape. We offer a wide range of lights to fit any need. We also offer solar landscape lights that are environmentally friendly as well as friendly to your electric bill. Our outdoor landscape lights are easy to install and contain all necessary hardware. Outdoor Contractor Landscaping Tools - Rakes, Shovels, tamps, etc. Dreamscape outdoor landscaping tools can make your life landscaping job a breeze. We offer a wide range of high quality landscape rakes, shovels, tamps, etc. Our landscaping rakes, shovels, and other tools are shipped right to your door. It couldn't be easier. No more running around all over town looking for a specific hard to find landscape tool.